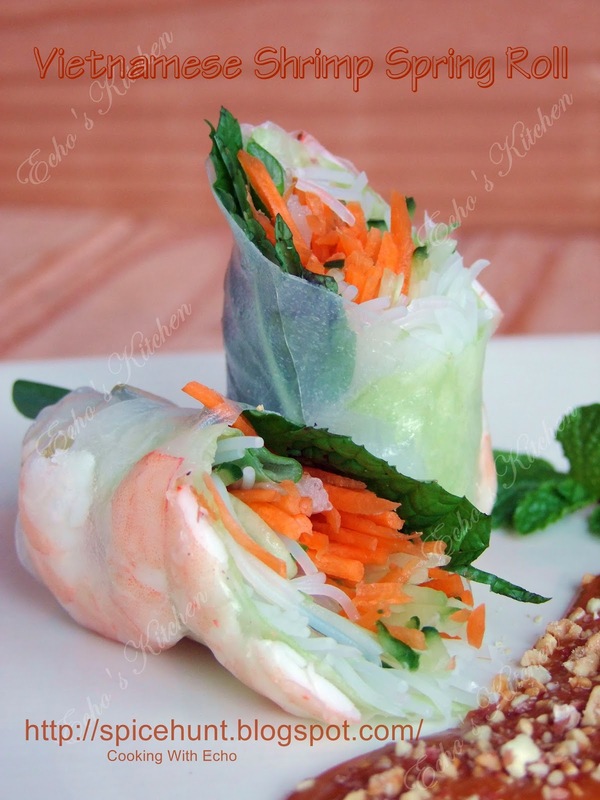 Like I mentioned in my earlier post, we love Vietnamese spring roll. I bought this rice wrapper couple of weeks ago from a Chinese supermarket, it was sitting in the pantry for a long time. Every time NS opened the pantry door, he will ask me : "How long do you think this stuff will sit here?" 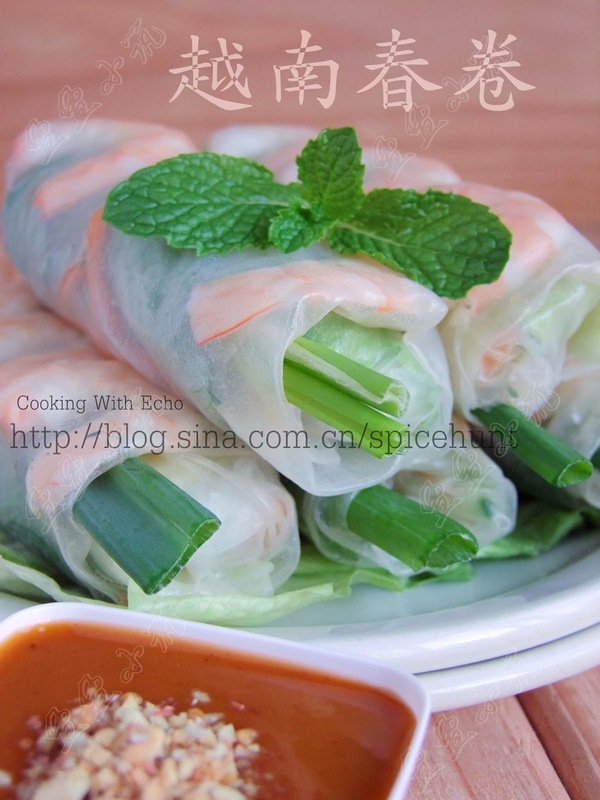 Its his way of requesting for a homemade spring roll. So one has to oblige because a happy husband with happy tummy makes happy home. Right? 1. Clean and devein the shrimp, boil in water until it changes color, dish out, shell and halved side wise. Note: Keep the broth/water you boil shrimp with, it is a good stock for noodle soup later. 2. 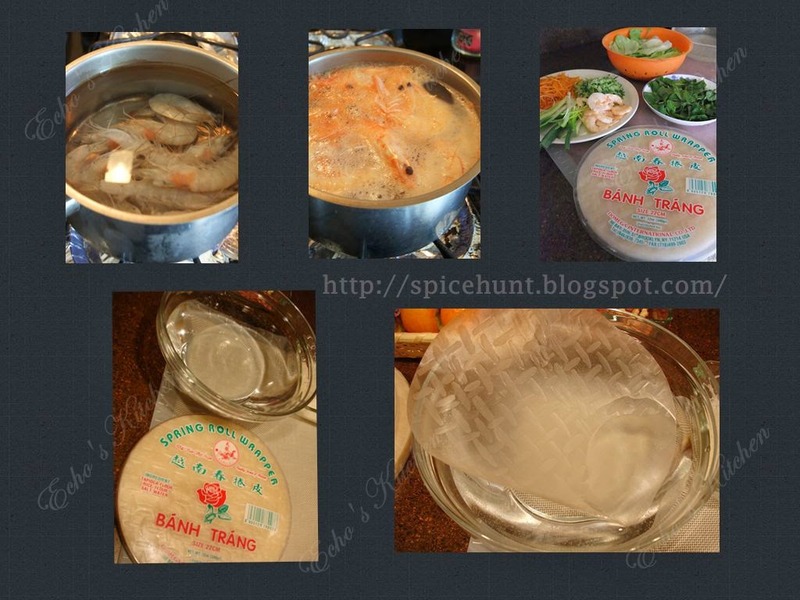 Soak rice vermicelli in water until soft, about 10 minutes, /blanched in boiling water for 2-3 minutes. 3. Prepare the remaining ingredients accordingly, i.e shred, clean and cut. Note: It is very important to prepared the stuffing ahead of time and have them all ready and accessible when you assemble the spring rolls. 4. 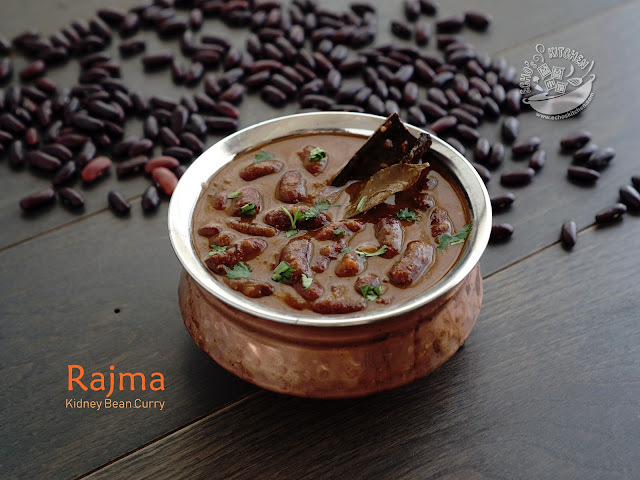 Heat up 1/2 bowl of drinking water in microwave or over the stove whichever you see fits, the water need to be only slightly warmer than room temperature, not hot to touch but warm enough to soften the rice wrapper. Place the water in a container big enough to insert rice wrapper wholly. 5. Lightly and quickly soak the wrapper in water, then place the wrapper on a clean, nonstick surface (I used my silicon baking mat). The wrapper should be still quite hard when you place it on the working surface. It will continue soaking up water as you assemble the roll, it takes only under 1 minute for this rice wrapper to be completely soft. So DO NOT over soak the wrapper. 6. 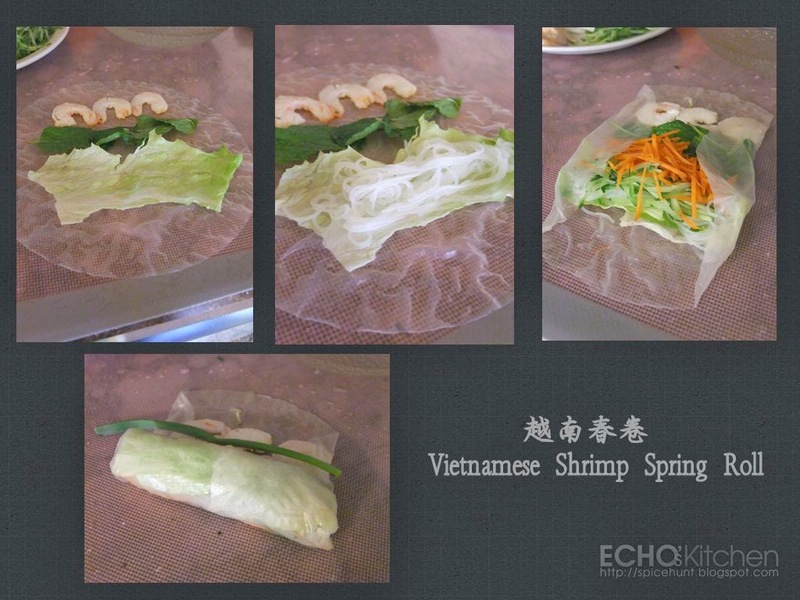 This is how you assemble a spring roll, on the top 1/3 of your rice wrapper, place 3 halved shrimps, then in the middle place 3-4 basil leaves, and 3-4 mint leaves. At the bottom 1/3 of the wrapper, you place a palm size lettuce, the lettuce will work as holder to remaining of the ingredients and also work as protector to the fragile rice wrapper from other sharper ingredients like carrots to poke through, it gives strength to the wrapper and allows tighter rolling. 7. Place a small bunch of vermicelli over lettuce, followed with shredded carrots and bean sprout. 8. Now the fun part, gently pull both the side of wrapper and fold it in, then using both hands, gently pull the bottom of the rice paper from surface and roll over fillings, at the same time, use your fore fingers to hold and tuck the fillings as you roll, this will let you hold the fillings together gives firmer and hence straighter roll. 9. I like part of my spring onion stick out from the roll, I think it is the cutest thing on the roll, so I insert my spring onion before rolling the shrimp over (as shown in the picture). Do not over stuff your spring roll, practice 1 or two before you know how much to fill the size of your wrapper. 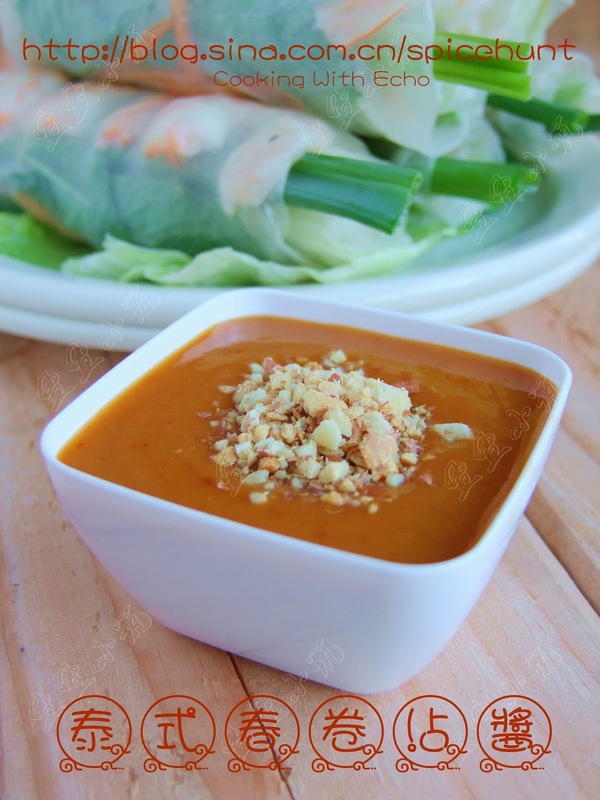 With some home made Thai/Vietnamese spring roll dipping sauce, lunch is served!